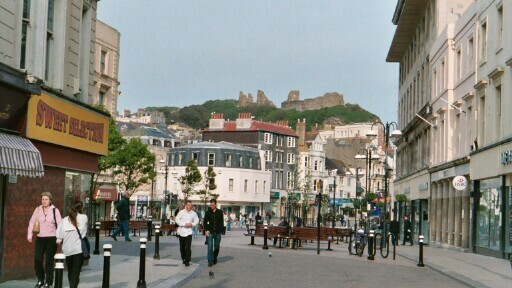 The town of Hastings lies on the Sussex coast in the south-east of England. The historic “old town” of Hastings nestles in the valley between two hills, with the modern town to the west of them. The town of St. Leonards-on-sea, founded in the 19th century to the west of Hastings, has grown to the point where the two towns are now contiguous and form part of one combined borough. To the west is Bexhill-on-sea, to the north Battle, and to the north-east the historic towns of Winchelsea and Rye. 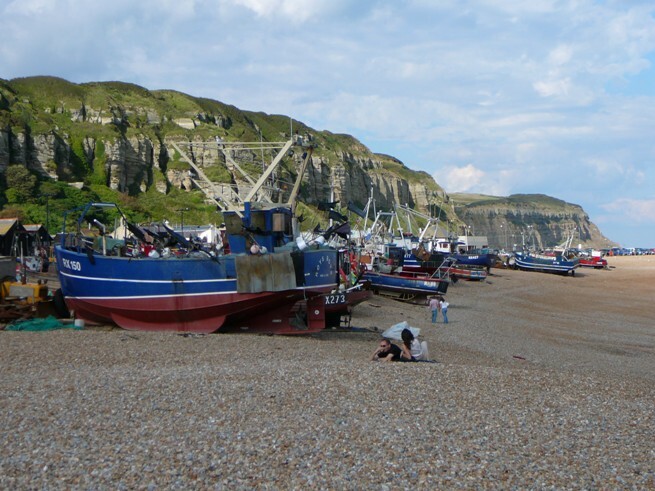 Hastings is on the A259 coast road that runs the length of Sussex from Chichester in the west through Brighton Eastbourne and Hastings, and on eastwards to Rye and into Kent and the English Channel port of Folkestone. If you are coming by road from London or the north, take the A21 south from the M25. By rail, trains go east to Rye, then on to Ashford. To the west, the trains go along the coast to Bexhill, Eastbourne, Lewes and Brighton. For London, the most direct route is the Charing Cross service which takes about 1 hour 45 minutes, going through Battle and Tunbridge Wells. There is also an alternative London service going west to Lewes and then north via Gatwick to Victoria. As well as the main Hastings rail station there is a smaller one called Ore to the east which is convenient for the Ore, Halton and Clive Vale areas of the town, and there are two stations in St. Leonards-on-sea: Warrior Square, in the heart of St. Leonards served by all the trains, and West St. Leonards which is for trains on the Charing Cross line only. “Hastings” means, literally, the sons or dependents of “Haest”, and the town seems to have been founded by a chieftain of this name, or by his followers. It seems to have been a more-or-less self-governing enclave within what was then the Saxon kingdom of Sussex, during the “dark ages” of Britain. This has suggested to some scholars that Haest and his followers were probably not Saxons like their neighbours, but may have been perhaps a Danish or Jutish people. The town is best known because of the Battle of Hastings in 1066. Duke William of Normandy invaded Sussex and, having seized the fishing village of Hastings, quickly erected a make-shift wooden fort out of prefabricated parts that he had brought with him over the English Channel from Normandy. The English King Harold and his army were in the north of England at this time, and William being unopposed started laying waste to the country around, possibly in order to provoke Harold into a premature attack. If so, the tactic succeeded. After a forced march of several hundred miles, Harold’s army confronted the Normans at the Battle of Hastings on 14th October, and lost. Harold himself was killed along with his two brothers. Although pockets of resistance to the invaders remained, effectively it was all over. On Christmas day 1066 William was crowned king of England in London. The effects on England of the Norman conquest were cataclysmic. Unlike other famous battles such as Agincourt or Waterloo (which though spectacular did not really have much effect upon subsequent events) the Battle of Hastings really did alter the whole course of our history. It is fascinating to speculate what would have happened if Harold had won: it was after all no easy victory for the Normans, and the result could well have gone the other way. The effects of the conquest on Hastings were equally drastic. In the course of his depradations William appears to have pretty well destroyed the town – at least that seems the most likely explanation for the fact that Hastings is not even mentioned in the famous “Domesday Book” in which the Normans meticulously recorded every other settlement in England and the value of everything in it. The Normans stamped the sign of their victory upon the landscape however in the form of the stone castle, replacing their original wooden one, whose ruins can still be seen and visited on the West Hill today. The actual site of the battle was traditionally thought to be located some eight miles inland from Hastings, on the hill where the Normans built an Abbey to celebrate their victory, around which grew the town now called Battle. Recently however local investigator Nicholas Austin has put forward a convincing case for suggesting that the battle actually took place just outside Hastings itself, near the present day village of Crowhurst. The jury is still out on this controversy, but it certainly seems odd that no relics of the battle, or of the many soldiers who were killed, have ever turned up on the slopes of Battle Abbey. Hastings flourished during the Middle Ages as one of the leading members of the Cinque Ports confederation – a group of towns along the south-east coast that were granted special privileges by the King in return for providing and manning ships when needed – usually for fighting against the French. However after the silting up of Hastings harbour, and the conquest of Normandy by France, Hastings was of little further use as a port. The town became once again just a modest fishing community with a lively sideline in smuggling, until the fashion for sea bathing at coastal resorts gave Hastings a new lease of life in the 18th century. One side-effect of this was the planning and building of a new town just to the west of Hastings by the architect James Burton. 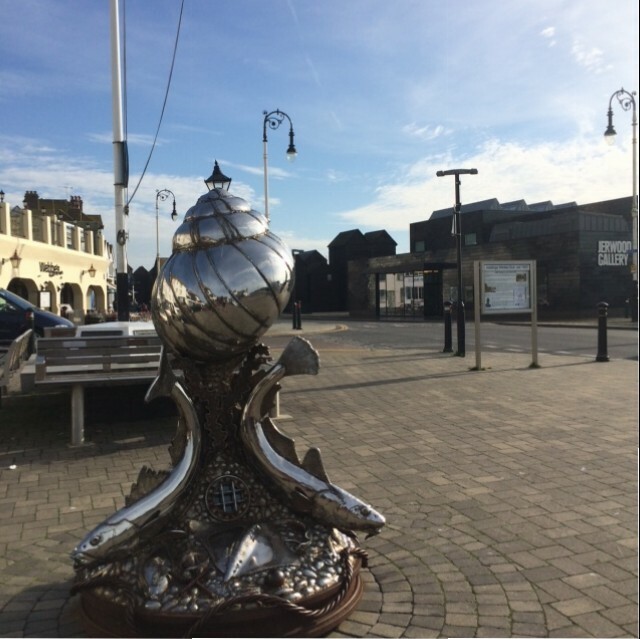 It was called St. Leonards-on-sea, and included some impressive features such as the Maze Hill Gardens and Warrior Square. As both towns continued to grow however they inevitably filled up the space between them, and merged effectively into one – although even today there are still noticeable differences in the “feel” of the two communities. The writer Sheila Kaye-Smith was actually born in St. Leonards, and her novel “Tamarisk Town” published in 1919 is set in a thinly-disguised Hastings under the name of “Marlingate” and describes how the town was transformed from a somewhat moribund fishing community into a fashionable seaside resort – though local historians will notice that for the purposes of the novel the author places this development several decades later than it actually occurred. This was not the first time that Hastings had appeared under a pseudonym in a work of fiction. There is a fascinating “snapshot” of Hastings in the early years of the 20th century in the pages of “The Ragged Trousered Philanthropists” by Robert Tressell, the pen-name of a decorator and sign-writer called Robert Noonan who lived and worked here for a while. Under the name of “Mugsborough” the Hastings of the Edwardian era is described from the viewpoint of the depressed and chronically hard-up workers in the decorating trade that Noonan knew so well, in the days before there was any such thing as “unfair dismissal” or social security. One of Robert Noonan’s contemporaries in Hastings was the celebrated French Jesuit philosopher Pierre Teilhard de Chardin, who lived here from 1908 to 1912. His experience of Hastings was very different from Noonan’s however! Teilhard spent his time here studying theology and in 1911 was ordained into the Catholic priesthood. Shortly afterwards Teilhard – a keen proponent of Darwinism – became involved in the notorious “Piltdown Man” fraud, although it has never been proved that Teilhard himself knew about the deception. The church where Teilhard’s ordination into the priesthood took place was the Catholic church of St Mary Star of the Sea, which you will find at the northern end of the High Street in the Old Town. This church has its own interesting story: it had been built in the mid 19th century from funds provided by the once-fashionable poet Coventry Patmore as a memorial to his deceased wife. It was at this church too that the writer Catherine Cookson, who lived and worked in Hastings from 1930 until 1976, was married in 1940 to local maths teacher Thomas, who is fondly remembered by generations of former pupils of Hastings Grammar School. Hastings had another brief moment in the spotlight of history in 1923 when at the age of 35 the Scottish inventor John Logie Baird came to stay on medical advice, hoping that the sea air would be good for his health, which was always poor. Having tried and failed to earn a living at assorted ventures which included making insulated socks in Glasgow and jam in Trinidad, it was in Hastings that he made the breakthrough that would immortalise his name: the invention of television, which was first demonstrated in his bedroom in Linton Crescent to a group of journalists. At about the same time, one of Hastings most famous sons was making a name for himself on the other side of the world. Archibald Belaney was born in Hastings in 1888 – making him the same age as Baird, as it happens – and was educated at Hastings Grammar School. His greatest wish was to live the life of an American Indian – and as soon as he was old enough, he ran away to Canada and became one! Having experienced at first hand the beauty and grandeur of the Canadian wilderness, he was one of the first to realise the implications of the destruction of the forests for commercial gain and the insidious spread of roads and cities everywhere, and he became in effect one of the earliest “conservationists”. 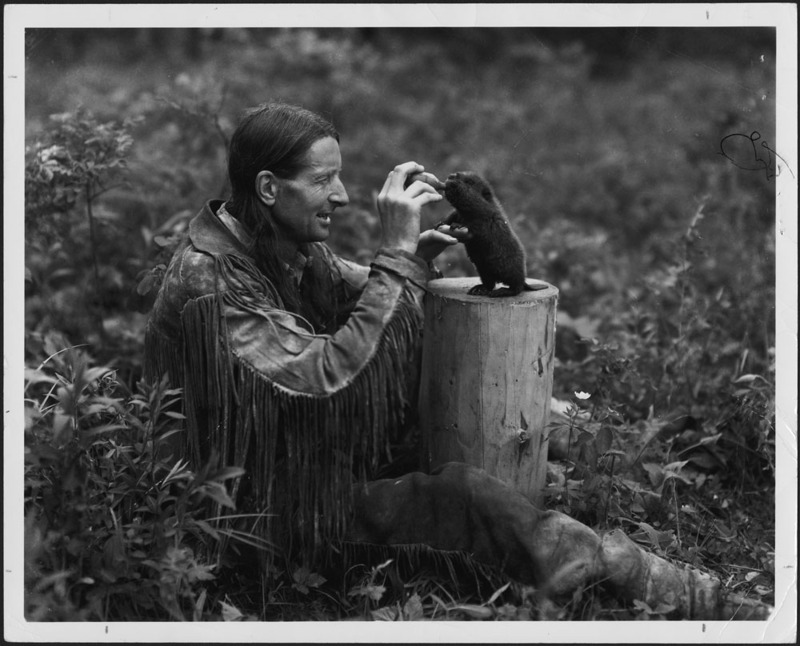 Using the pen-name “Grey Owl” he wrote passionately in defence of the wilderness and its creatures. His true identity only became public knowledge after his early death in 1938. It is well worth reading about his extraordinary life and adventures in his own words, in the books “Pilgrims of the Wild” and “Tales of an Empty Cabin”. Richard Attenborough’s recent film “Grey Owl”, starring Pierce Brosnan in the title role, tells a small part of his fascinating story. On the subject of actors, you may be interested to know that Cecil Parker was born in Hastings in 1897 – you may remember him playing King Roderick in the Danny Kaye film “The Court Jester”, or as the hapless Lord Loam opposite Kenneth More in “The Admirable Crichton”. A near contemporary of his was the conductor and composer Anthony Collins (probably best known today for composing the light-classical favourite “Vanity Fair”) who was also born in Hastings in 1893, in the house in Queen’s Road where his father kept a music shop. He began his career playing violin in a small local orchestra here before moving on to bigger and brighter things. Two important folk musicians were also born here in the 1930s: sisters Dorothy and Shirley Collins, whose ground-breaking 1969 album “Anthems in Eden” remains a landmark in English folk music. Shirley Collins still lives in Sussex, though Dolly sadly passed away in 1995. In the 1970s the blues singer and guitarist John Martyn lived in Hastings, and it was here that he created what is probably his best known album, “Solid Air”. In addition two top-flight folk fiddlers, Peter Knight (of “Steeleye Span”) and Barry Dransfield both lived in Hastings for many years. Peter Knight still tours in the trio “Gigspanner” with Hastings musician Roger Flack and percussionist Sacha Trochet while Barry Dransfield’s output from his Hastings years includes tributes to the local fishermen in the songs “Haul Away” and the ever-popular session favourite “I once was a fisherman”. Today Hastings has a population of something over 80,000 and depends heavily on tourism to earn its living. Hastings never quite achieved the prosperity of resorts like Bournemouth or Brighton, but it has a comfortable, “lived in” feel and a lot to recommend it which is not perhaps obvious to the casual visitor, such as Alexandra Park: a delightful gem situated just a short way from the town centre. Its streams and small ponds are home to ducks, moorhen and coots – and sometimes you can see cormorants, the odd heron or two, and even kingfishers if you are lucky. Just south of Buckshole reservoir the miniature steam railway offers rides at weekends and on school holidays. The café by the bandstand provides a welcome opportunity to relax with a drink or a meal, either inside or outdoors on the decking, depending on the weather! 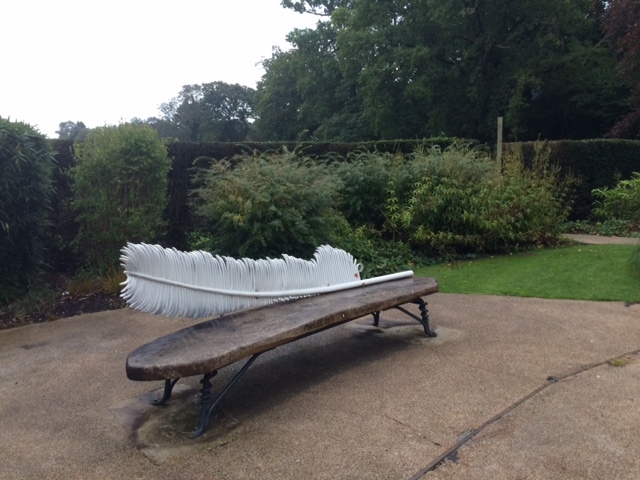 Adjacent to the rose garden nearby is the “peace garden” entered through attractive wrought-iron swinging gates, and there you will see a bench designed by Alan Wright and installed by the local Quakers in 2015 to mark the centenary of the First World War. Another easily-overlooked attraction is the remarkable museum and art gallery in Cambridge Road, half a mile up the hill from the town centre. Entry is free, and inside there are some remarkable collections of artefacts from the far east and also from American Indian culture – including of course a special feature on Hastings’ own pseudo-Indian, Grey Owl (see above). Also in the museum is a model of John Logie Baird’s first television apparatus. Interestingly, one of the co-founders of the museum back in 1889 was the solicitor Charles Dawson, the notorious “Piltdown Man” forger. Being a traditional seaside resort of course Hastings has a pier, dating from Victorian times. This local icon however has had a chequered history of late. Closed to the public in 2008 due to fears about its safety, it was extensively damaged by fire two years later – some thought irreparably. However due to massive public support it rose from the ashes – literally! – and reopened in April 2016. If you are shopping in the town centre, don’t miss the charming Victorian-built Queens Arcade, just off Queens Road next to the cinema where you will find real, local shops (not branches of some ubiquitous chain-store) including a butcher, a fishmonger, a greengrocer and an old-fashioned sweet shop. The inventor John Logie Baird rented an apartment here to carry our his early experiments on television, before the landlord turned him out for causing explosions! It is well worth exploring the northern half of Queens Road too, where small family-owned businesses tend to proliferate. You can get exotic eastern-European food served at very modest prices in the colourful Sunshine café, and all sorts of interesting goods from cheese to chocolate to buy at the Queen’s Deli just opposite. A little way further along at the Grand Rue de Pera café there is good coffee served at a remarkably cheap price and you can also buy packets of organic fair-trade coffee and chocolate to take away with you. Further along still and almost at the top of the road the Imperial pub has a fine selection of real ales including some brewed on the premises, which you can enjoy along with a hand-made pizza. Down on the sea front, heading east towards the Old Town you will see Pelham Crescent and its centrepiece St. Mary-in-the-Castle, magnificently restored with its Georgian columns and soaring dome. On the West Hill above, the ruins of the Norman castle are a major attraction as are St. Clement’s caves nearby. For those who enjoy walking in the countryside, the unspoiled Country Park stretches from the East Hill up and down the glens and over the “fire hills” to Fairlight – and further if you can manage it! The Old Town, nestling between the East and West Hills, is well worth exploring: as well as the picturesque houses and shops, the streets are riddled with a surprising network of little alleyways (or “twittens” as we call them in Hastings!) while the beach at The Stade is home to the largest shore-based fishing fleet in England. At the eastern end of the Old Town past “Winkle Island” with Leigh Dyer’s eye-catching sculpture of a huge winkle in shining metal, you can go down the street called “Rock-a-Nore” past the iconic tall, dark “net huts” to find the famous Hastings fishmarket, where you can buy freshly-landed local fish from the wooden cabins to be found both in Rock-a-Nore itself and also along the walkway that runs parallel to it, at the edge of the beach: much better than buying pre-packaged fish from chain-store supermarkets! There are lots of great places to eat in Hastings. In the town centre there are some interesting places in Robertson Street including The Owl and The Pussycat, Bullett’s café (currently open Wednesdays to Saturdays only), and a snug little Italian restaurant called Rustico. Walking westwards along the sea front from there in the direction of the pier you will see the excellent Indian restaurant Ocean Spice, and then further on is Mungos, a dog-friendly cafe/restaurant, serving food cooked to order and a range of bottled beers and ciders. A little further on, almost opposite the pier and next to the White Rock Theatre, the White Rock Hotel always has some interesting “real ales” and an attractive food menu, while just opposite the cafe on the pier offers tasty food and drink along with delightful views along the coast in both directions. Turning in the other direction, going east along the sea front takes you to the iconic Old Town of Hastings. Arriving in George Street, first you will see the Albion public house, offering a good selection of real ales and ciders as well as good food and a lively music scene. Nearby is the surprising Boulevard Bookshop which, in the evenings, transforms itself from a second-hand bookshop into a lively Thai restaurant! There are also friendly cafes in George Street – such as Hanushkas (where incidentally dogs are welcome) and good quality restaurants such as Whites and Lathams. At the end of George Street turn left into the High Street to find Judges Bakery, which featured in The Independent newspaper’s 2006 guide to the top 50 food stores in Britain. Various kinds of organic bread are freshly baked on the premises each day, and they also have a wide selection of other organic food and drink of all kinds. Right next to Judges, don’t miss the wonderful Penbuckles cheese and wine shop, specialising in local produce. Almost opposite is the popular Jenny Lind pub, with an impressive array of real ales and a regular schedule of live music. Heading further up the High Street near to the northern end you will find the Storm café serving excellent coffee (though be warned, they do not open at weekends and on other days they close at 2.30 pm) and almost next door is the charming “First In Last Out” public house which serves good food and good beer – including their very own brew. Entertainment in Hastings can be found at the White Rock Theatre just opposite the pier, the Odeon cinema in the town centre, and for less “commercial” films the smaller “Electric Palace” cinema in the old town’s High Street, which in 2008 was named by The Guardian newspaper as one of the top ten independent cinemas in Britain. There is also a remarkable amount of creative talent in the town: artists, writers and musicians seem to be particularly attracted here. Local bands and performers can be heard pretty well every night of the week in one place or another. Jazz music is available monthly at the East Hastings Sea Angling Association building by the beach in the Old Town, and weekly on Thursday evenings in the NUR restaurant in Robertson Street in the town centre. Festivals of every sort abound in Hastings, beginning with the 5 – day long musical extravaganza in mid-February we call “Fat Tuesday” (which is of course simply the English translation of “mardi gras”) which takes place in numerous venues all over the Old Town. This is quickly followed by a major cultural event, the Hastings international piano concerto competition, held over several days from late February to early March at the White Rock Theatre, attracting talented young pianists from all over the world. This runs in parallel with the Hastings Musical Festival which is more for local people to strut their stuff, and encompasses all manner of performing arts. Watch out for the morris-dancing festival of “Jack in the Green” over the early May bank holiday, the weekend-long “Town and Country Show” in Alexandra Park in June, closely followed by the annual “Crazy Golf” world championships on the sea-front, which attract competitors from all around the world. “Pirates’ Day” in July is basically an excuse for dressing up pirate-fashion and having a good time. With the autumn comes the weekend-long “Seafood and wine” festival in mid-September, the Hastings Bonfire with its magnificent fireworks display on the Saturday closest to 14th October (battle of Hastings day!) and in November the Herring Fair celebrating Hastings heritage of fishing as well as other locally produced food and drink. Finally for 10 days over the New Year period the prestigious Hastings International Chess Congress, which attracts the best players in the world – past winners have included Boris Spassky and Anatoly Karpov. Turning to St. Leonards, the streets at the heart of Richard Burton’s original town are well worth exploring. Particularly striking is the Marina Court building on the sea-front, constructed to resemble the shape of an ocean liner! At the ground level is an eclectic mix of shops, art galleries and cafes. London Road, Kings Road, Norman Road, and Grand Parade on the sea front are places where small shops, cafes and family-run restaurants appear able to thrive, despite the prevalence of chain-store commercial empires in the Hastings shopping centre. Popular restaurants abound along St Leonards sea front, including the Italian “Bella Vista”, the Nepalese “Gurkha Chef” and the ever-popular “Kassa” and “Bonjour” cafes, all of which can be found in Grand Parade near the bottom of London Road. If you want to go for a drink in St. Leonards, the oldest pub in the town, namely the Horse and Groom in Mercatoria, is also one of the friendliest and most popular. Further to the north, the North Star in Clarence Road, just off the shopping area of Bohemia Road, has a fine selection of real ales and a seriously impressive array of single-malt scotch whiskeys. St. Leonards has plenty of entertainment going for those who know where to find it. In Norman Road there is the “Kino-Teatra”, a cinema which also houses a bar and a restaurant! The jazz scene is every Thursday night at the Azur restaurant, on the promenade opposite Marina Court. July sees the lively weekend-long St. Leonards festival based in Warrior Square gardens, and on the last Saturday on November occurs the colourful and energetic “Frost Fair”, a recent revival of an ancient European tradition. The acclaimed singer-songwriter Claire Hamill, originally from Middlesborough, has lived in St. Leonards for many years now and regularly performs at venues around the area. Along with – perhaps because of – their vigorous artistic communities, Hastings and St. Leonards both have a distinctly “Bohemian” and somewhat radical undercurrent. One eminent Hastings resident is Andrea Needham, who made headlines in 1996 when she and two other women broke into a British Aerospace factory in Lancashire and took a hammer to a Hawk attack fighter plane which John Major’s government was going to sell to the government of Indonesia – which at that time was busily trying to exterminate the population of East Timor. The women were put on trial at Liverpool Crown Court for damaging the plane but were sensationally acquitted by the jury on the grounds that they had acted in order to prevent a crime. Neither John Major nor anyone from the Indonesian government or military were ever arrested for the murder of over 18,000 East Timorese. St. Leonards meanwhile is home to the peace activists Maya Evans and Milan Rai, who made legal history in October 2005 when they became the first people to be convicted under the notorious Serious Organised Crime & Police Act 2005 for the crime of holding a political demonstration in Parliament Square in London, by reading out the names of those (on both sides) who had died in the invasion of Iraq. Merry England!